Just hours after Storm Eleanor departed the resort, leaving a stream of debris in her wake, a fresh weather warning has been issued for Blackpool and the Fylde coast. The Met Office said strong winds are expected until 7pm today, though they won't be quite as strong as the 65mph gusts recorded in the early hours of yesterday. The forecaster, which issued a yellow alert meaning 'be aware', said: "It is likely that some coastal routes, seafronts, and coastal communities exposed to these winds will be affected by spray and/or large waves." 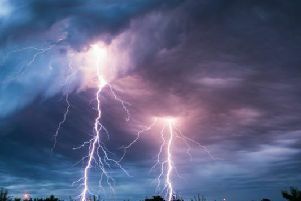 Winds of up to 60mph are expected at around 4pm, predictions showed, while there is also a 50 per cent chance of rain. Two people had to be rescued, one from her car; the overhead tram lines were downed; and a business in Little Eccleston was flooded during Storm Eleanor, which had council workers out in Wyre yesterday clearing away debris. Despite more widespread flooding being predicted, the region escaped the brunt of the storm, while there were no reported injuries, despite the Met Office warning of the potential for 'danger to life'. Debris was reported near the 'superpipe' at Anchorsholme, but a spokeswoman for United Utilities denied the structure had been damaged. She said: "The outfall pipe itself wasn’t affected by the storm, but the wind and waves along the promenade were extreme and there has been a bit of damage to some of the equipment stored there. "Windows were broken on some of the construction vehicles and our security cabin was even moved horizontally by the waves."